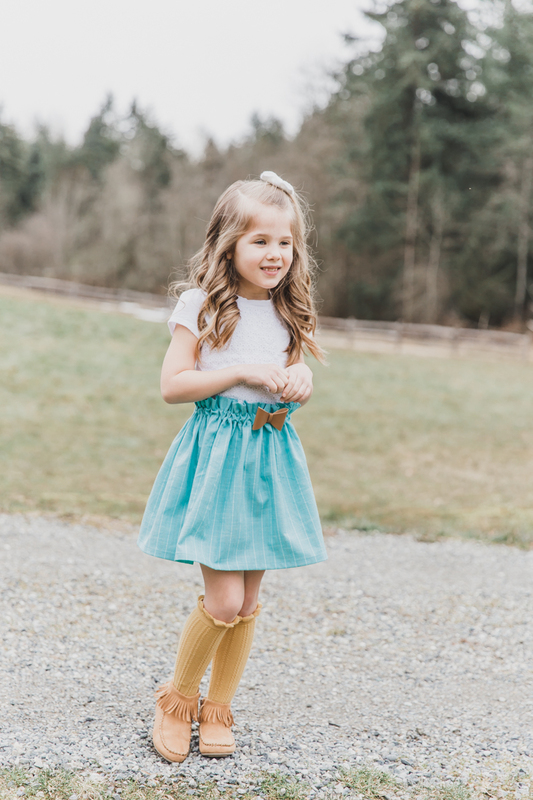 My girls adore wearing skirts, and I adore that they’re one of the quickest and most satisfying projects to make! 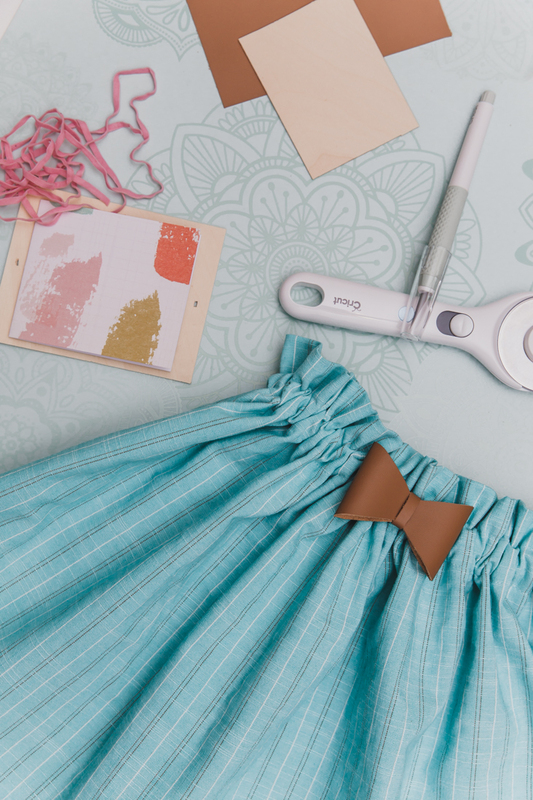 I love finding ways to make a simple skirt a bit more special, and today’s project will do just that! 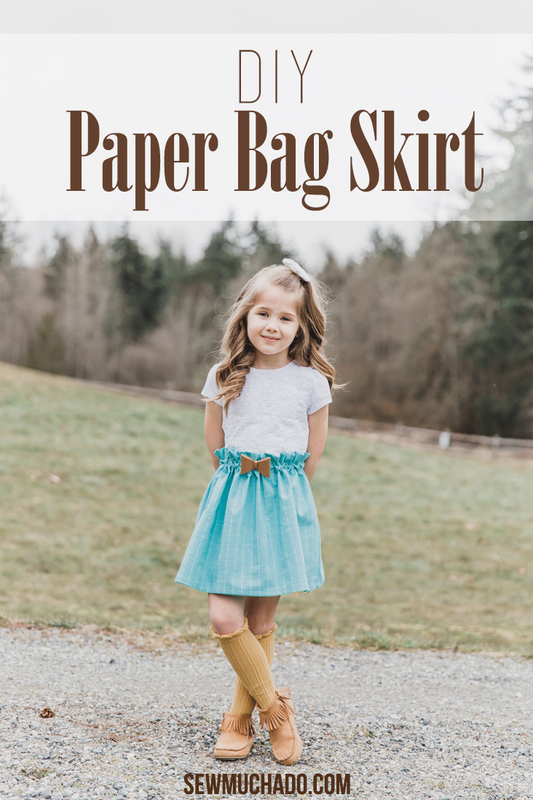 I’ll teach you how to make a DIY Paper Bag Skirt, and if you haven’t made one yet, you’ll soon be hooked! 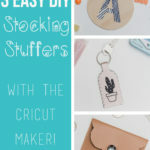 Last week I shared all about my favorite Cricut craft tools, and today this DIY paper bag skirt tutorial, sponsored by Cricut, will put them all into action! 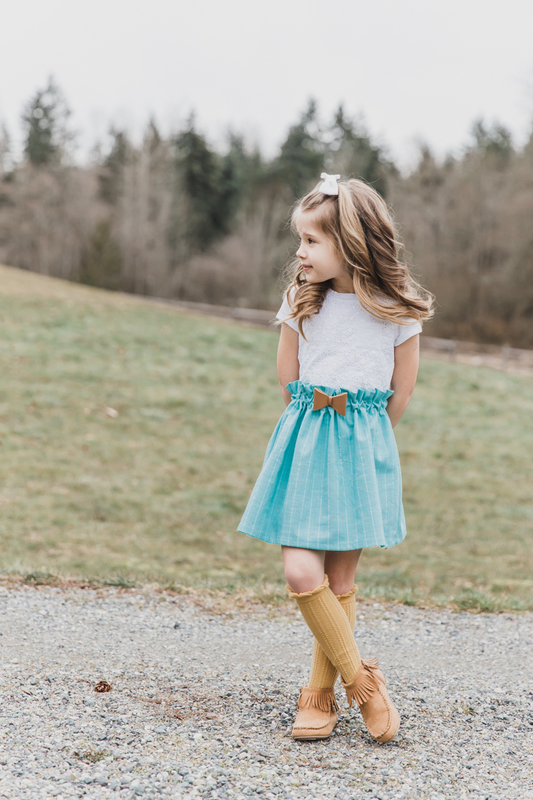 It’s a fun twist on a classic gathered skirt. 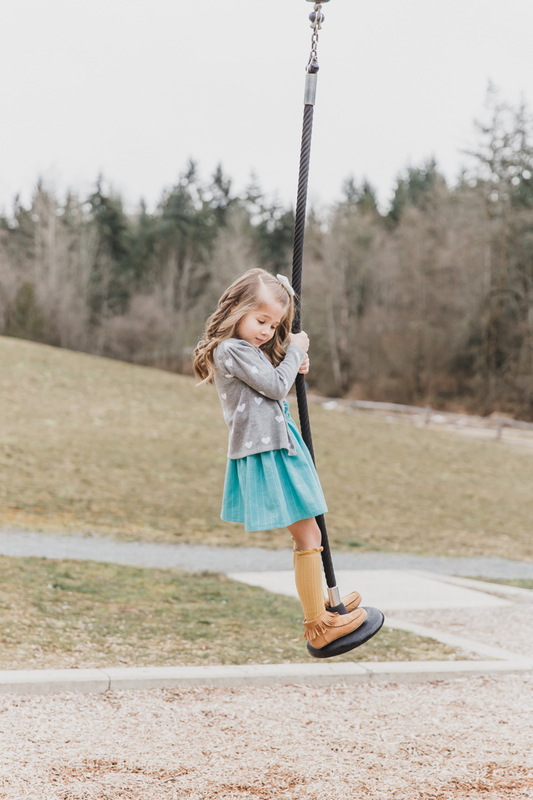 You could even mix it with our suspender skirt tutorial for a super cute skirt! 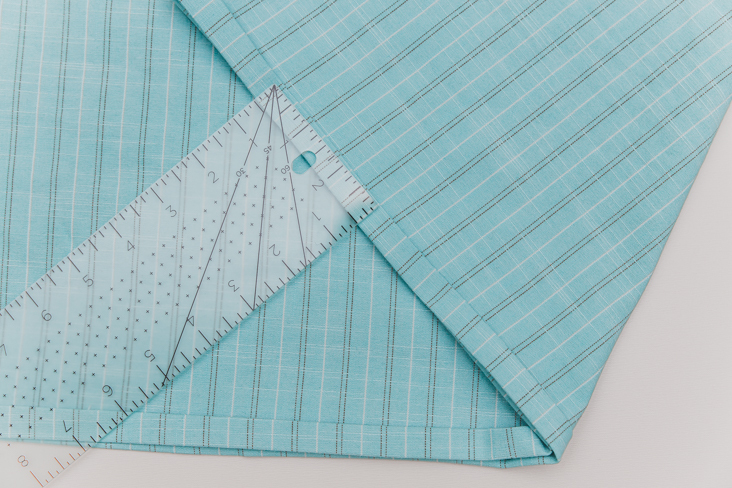 It never hurts to have your fabric match your tools, and the pretty mint colored tools were begging to be used with this striped fabric! 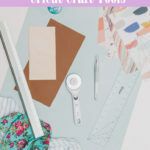 Or if mint isn’t your thing, you can also get the tools in a pretty lilac color (to match your lilac polka dot fabric, of course). 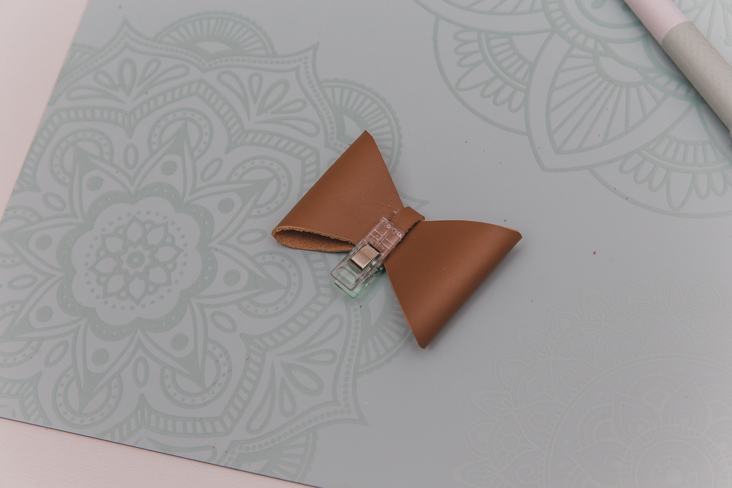 We’ll also make a removable leather bow that can also work great as a hair bow! 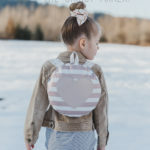 It gives our DIY paper bag skirt a fun extra detail. I’ve had this fabric for years. Literally. I bought five yards of it probably 9 years ago for $1/yard and I feel like it just keeps replenishing itself as I’ve used it! It’s such a nice weight, and has some stretch to it, and has been perfect for so many projects, so I’m not complaining. 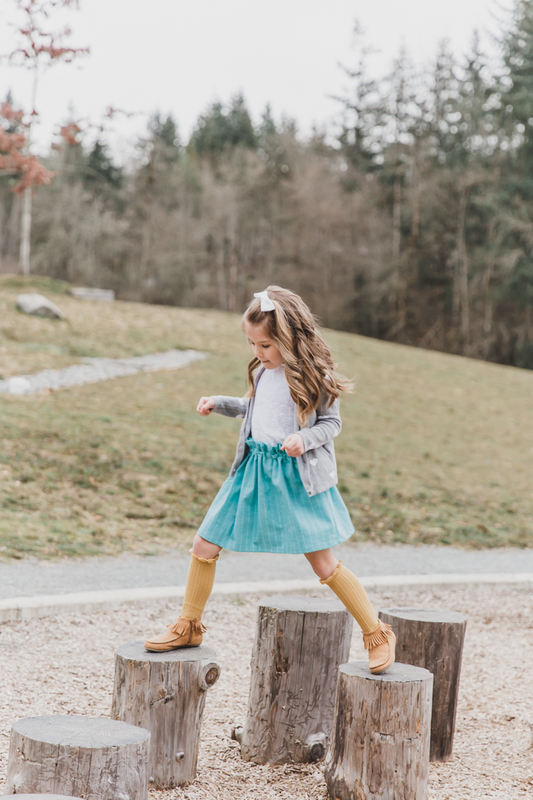 Whether it’s for church or play, a simple skirt is always the right choice. 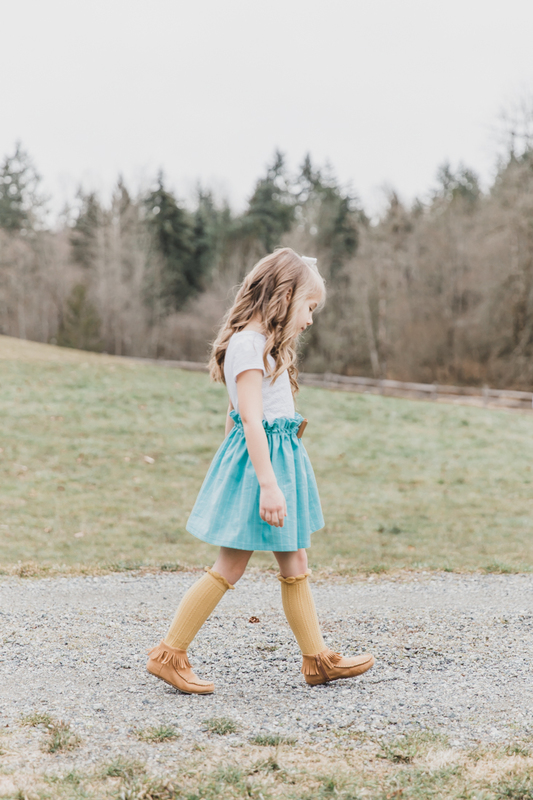 Add some knee socks and a cardigan on chilly days and she’s set! 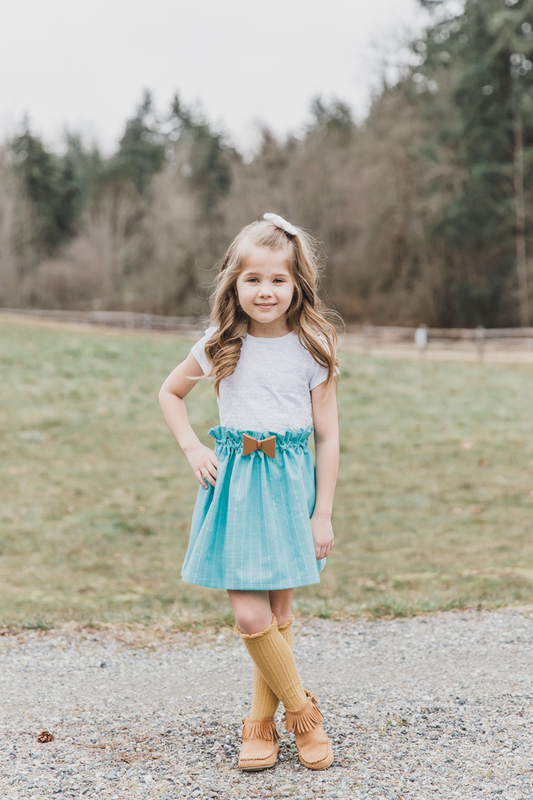 I love to give these sweet skirts as gifts, and am also sharing a fun way to package the skirt up to give to your favorite little girls. 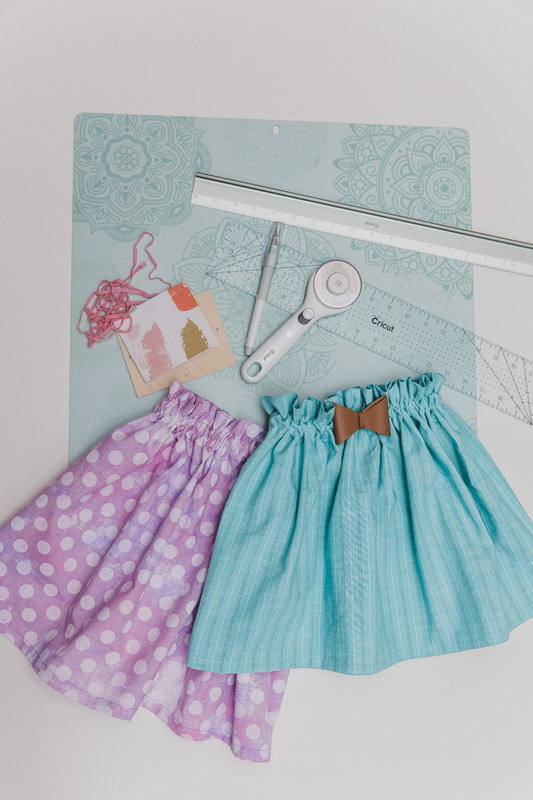 To start your DIY paper bag skirt, fold your fabric in half, matching selvages. Fold in half again, bringing fold to selvages. 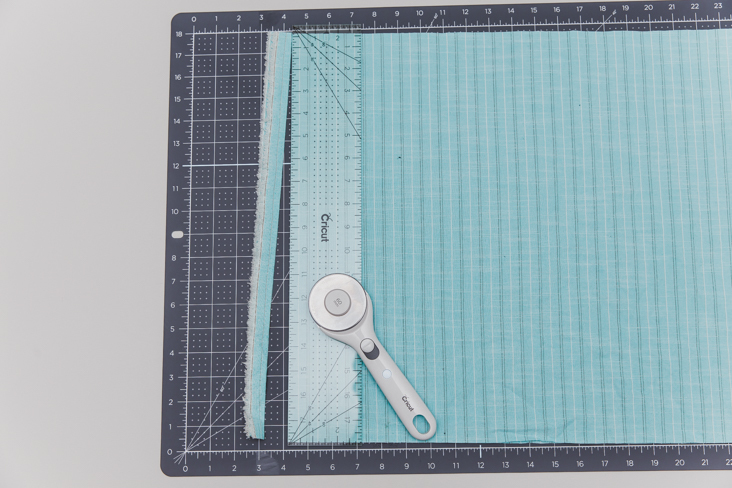 Using self-healing mat (one side is mint and the other side has a grid that you see below), rotary cutter, and acrylic ruler, trim end of fabric if necessary to be 90″ to folds and selvages. 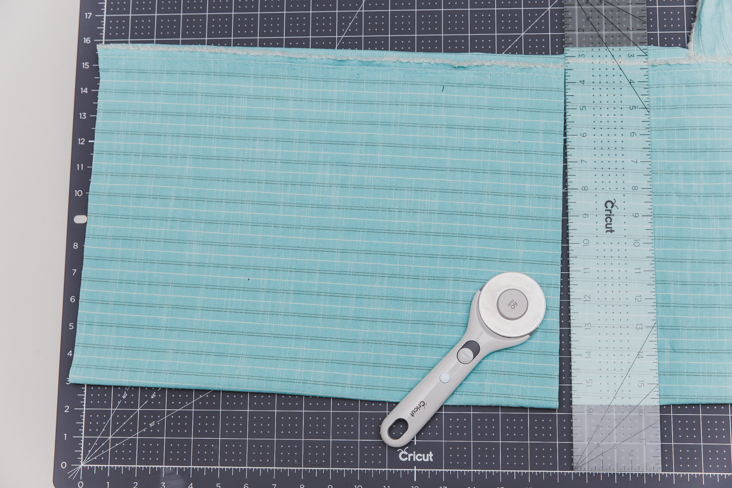 The rotary cutter is always my go-to for cutting fabric, and I love that I don’t have to disassemble and reassemble it to make it work for a lefty like me :). 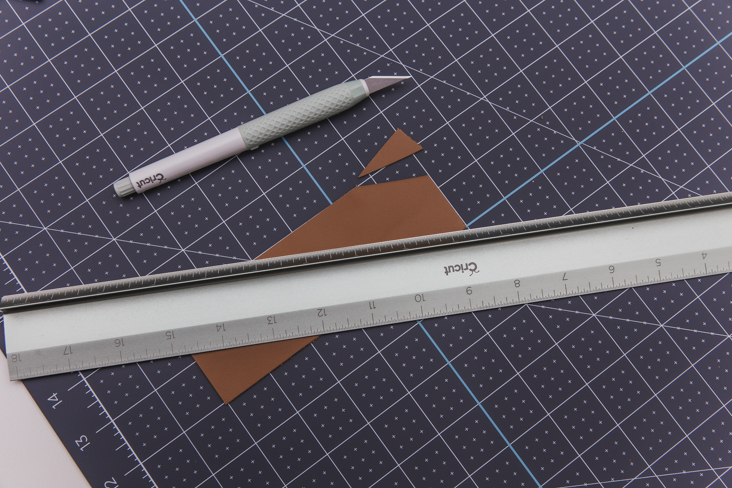 I often use my wider acrylic ruler for sewing projects, but I love having this smaller size for smaller projects – it’s so much easier to quickly grab when I need it. 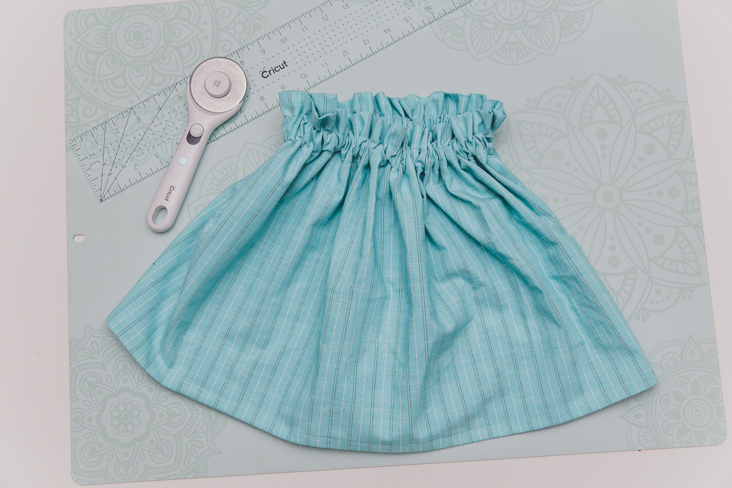 Determine ideal length of finished skirt (not including the “ruffle” above the elastic waistband, only the length of where you want the elastic to sit, to the hem). 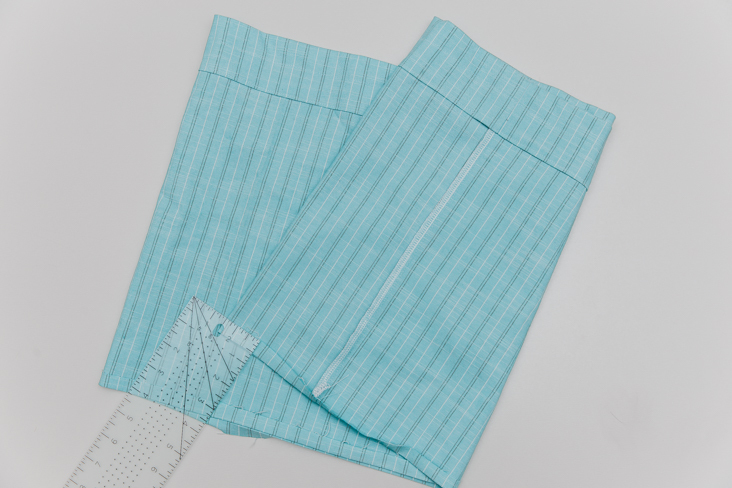 Add 4.5″ to the desired length (1″ for hem and 3.5″ for the top elastic casing and paper bag ruffle). 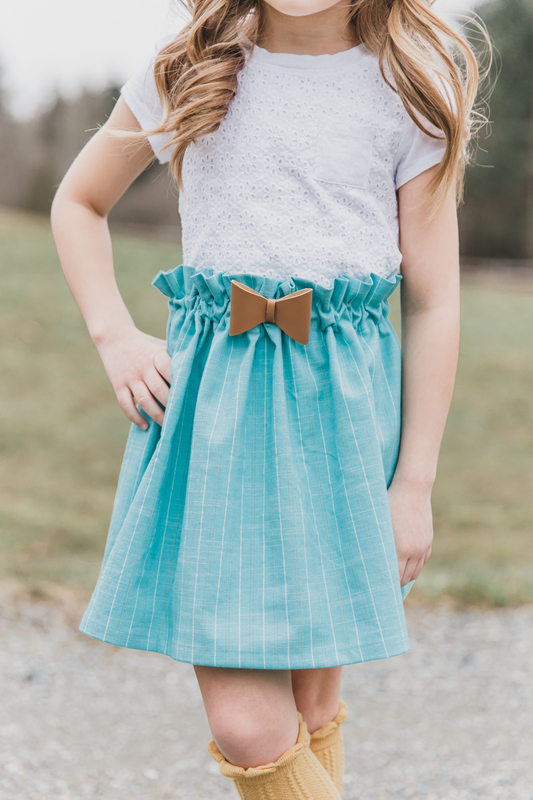 For my 5 year old, I wanted the finished skirt to be 13″, so I cut the fabric 17.5″ long. 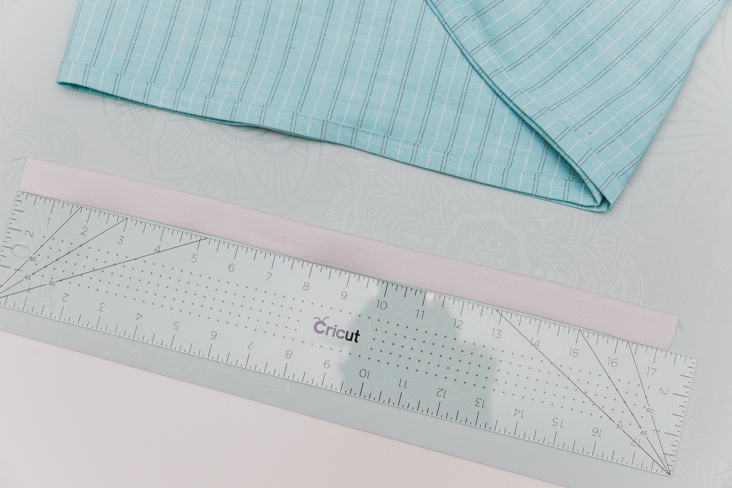 Use ruler and rotary cutter to trim selvages. 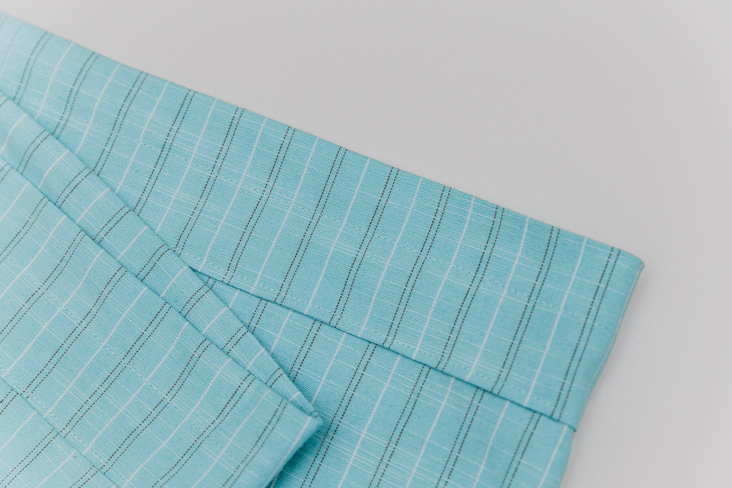 Since the fabric is close to 45″ wide, we’ll use the whole width (a 2:1 fabric to waist ratio is a great place to start for gathers, but depending on waist size, you can also piece to fabric pieces together to get a larger width if you’d prefer). Right sides together, stitch side seams. 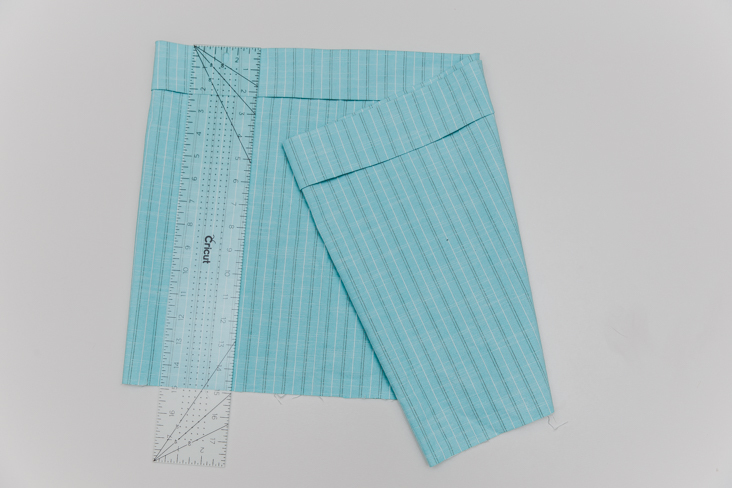 Press seam allowances open or to one side and finish seam allowance with serger or zig zag stitch. 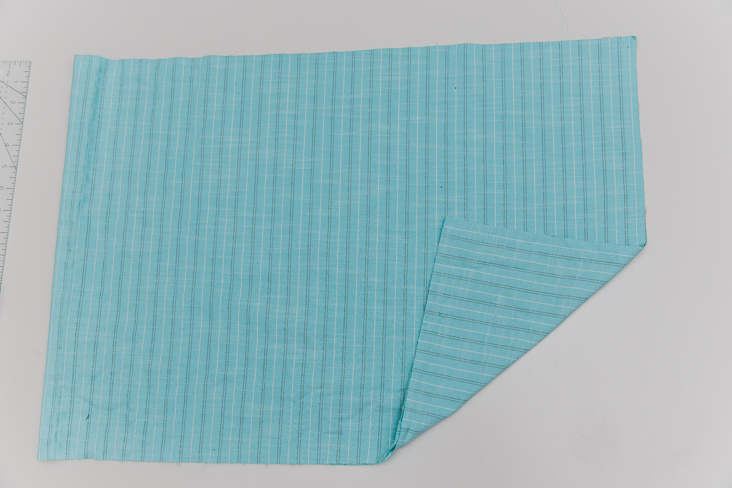 Press top edge of skirt 0.25″ to wrong side. Press another 2.25″ toward wrong side. 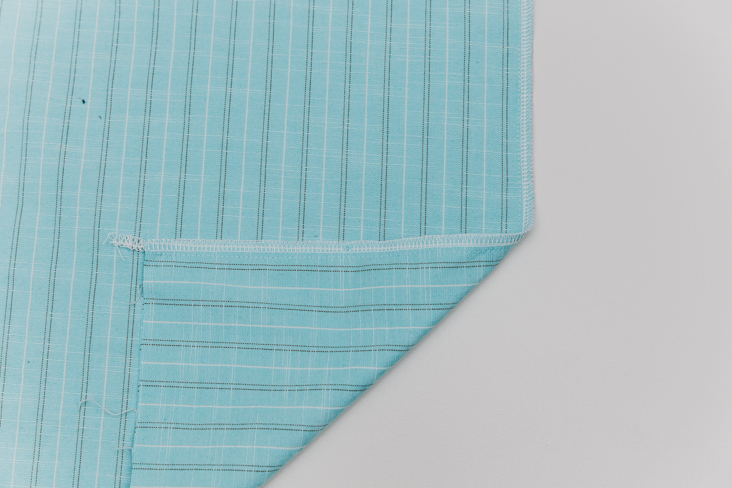 Stitch close to lower pressed edge, leaving 1″ opening (we’ll insert the elastic here later). Stitch again 1″ from the top, around the entire top of the skirt. There is no need to leave an opening. 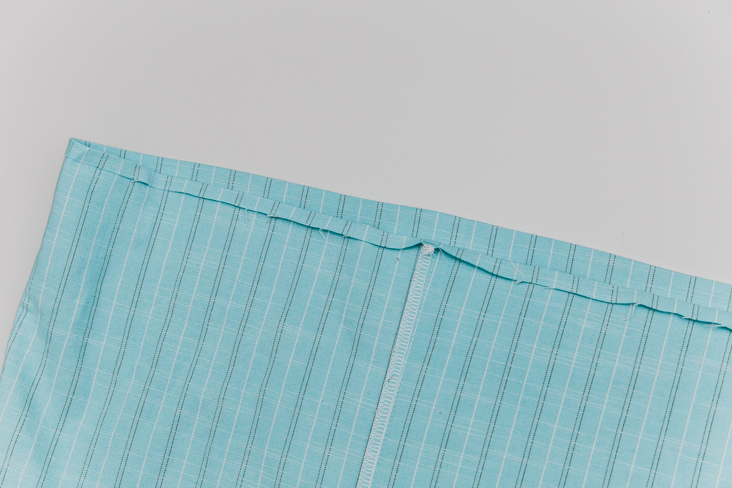 Press bottom edge of skirt 0.5″ to wrong side. 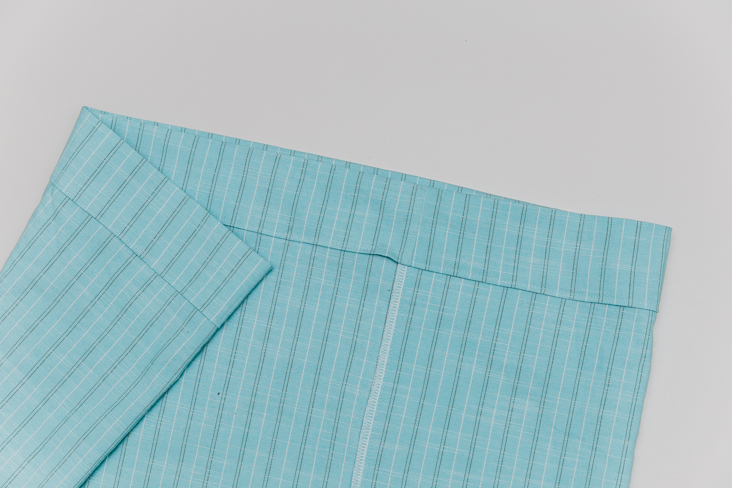 Press another 0.5″ to wrong side and stitch close to upper pressed edge to hem skirt. Measure elastic around waist, pulling snug but not tight. 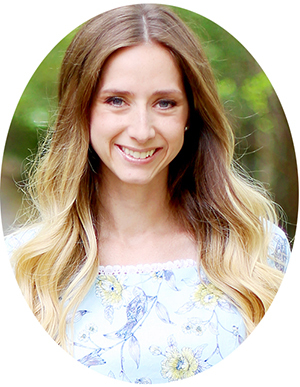 Add 1″ and cut. 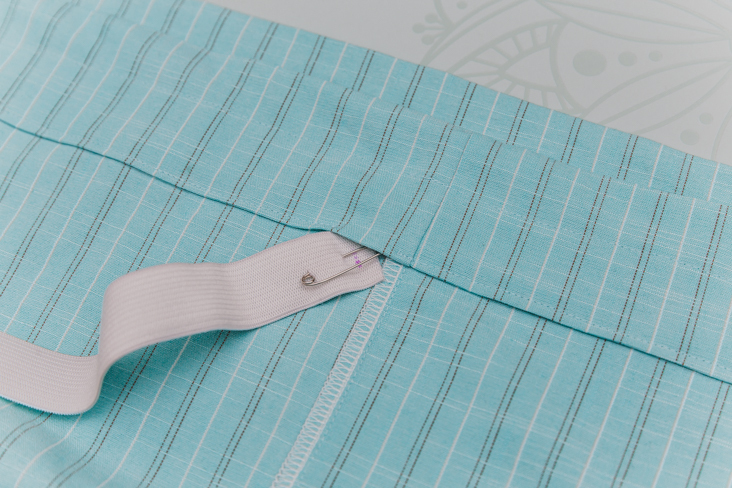 Use safety pin to guide elastic through opening and casing, and back out through casing. 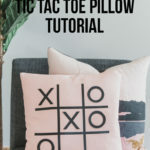 Learn my favorite tip for not getting the elastic twisted here! 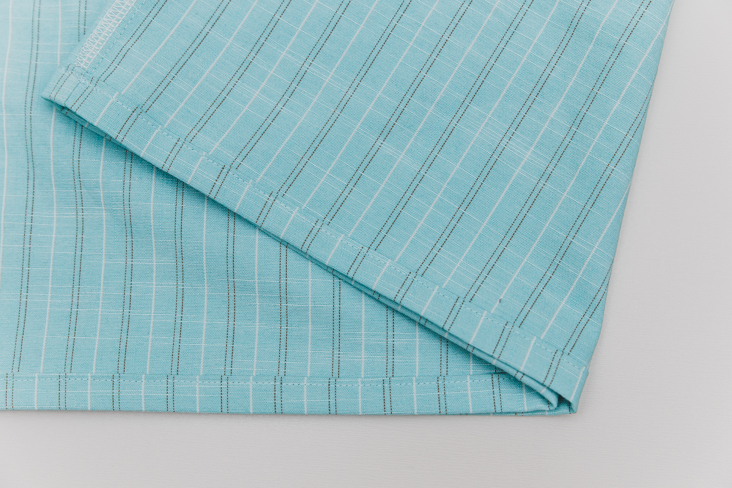 Overlap elastic ends 0.5″ on each end and stitch to secure together. 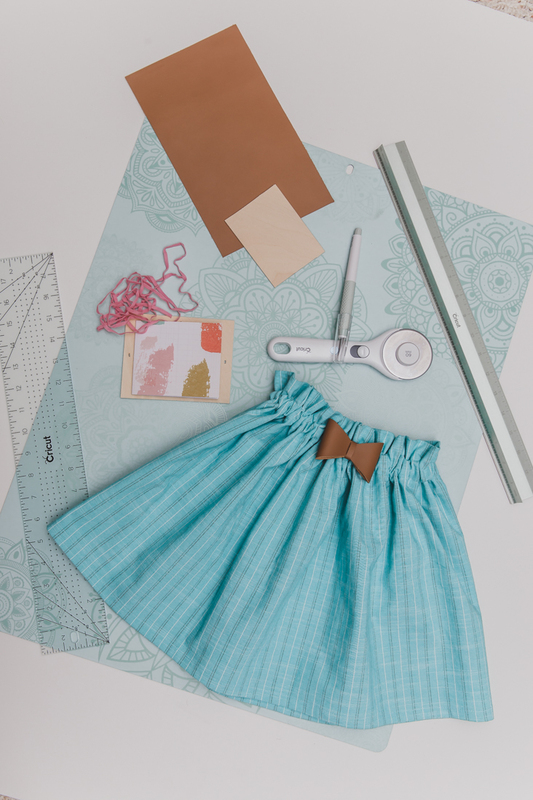 You’re almost done your DIY paper bag skirt! 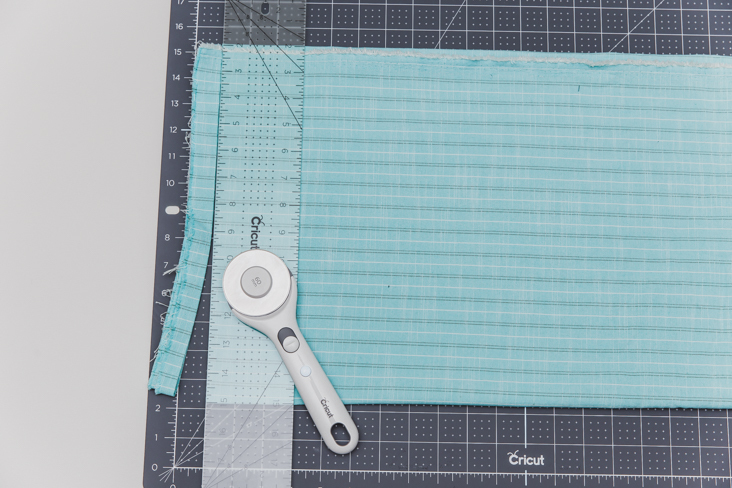 Allow elastic ends to slide into casing and stitch opening closed. 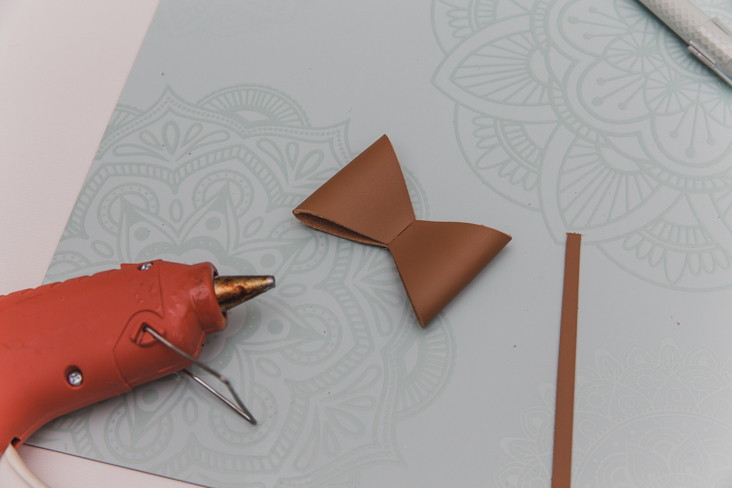 To give our DIY paper bag skirt a fun detail, we’ll make a removable leather bow that can be removed for washing (it also makes a great DIY leather hair bow if you add it to a hair clip! 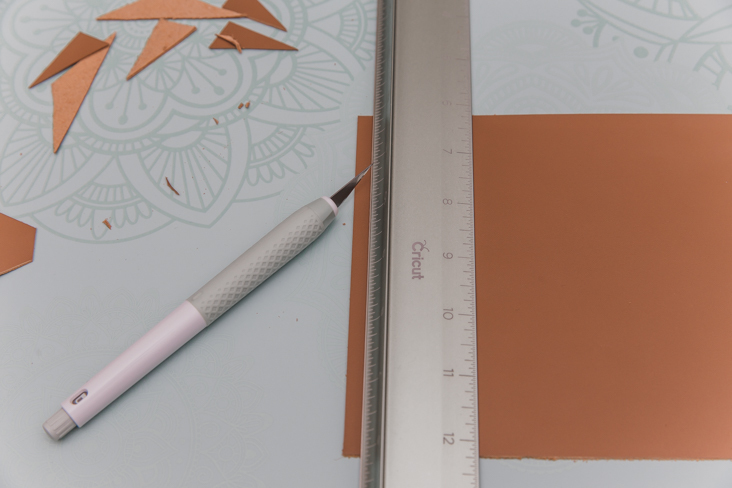 ), grab some Cricut Genuine Leather and use a true control knife and cutting ruler to cut a piece approximately 6″x2″. The true control knife slices through the leather so cleanly and I don’t have to worry about my fingers thanks to the guard! 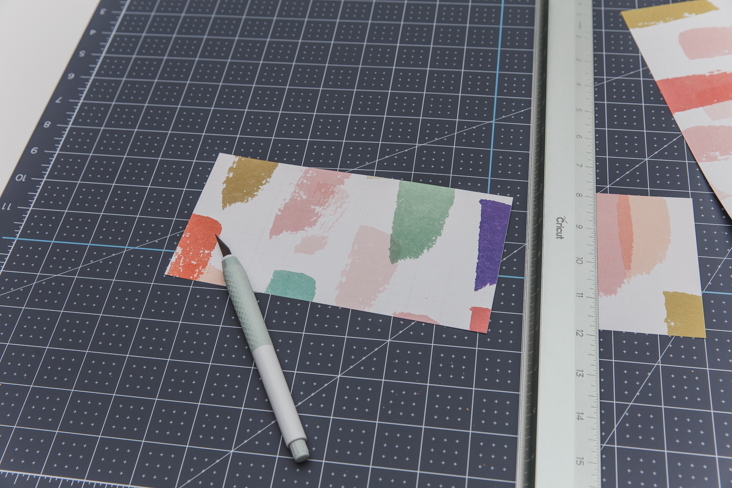 Cut a corner off as pictured, approximately 3/8″x1.5″ on two sides. Use the piece cut off to repeat the cut on the other corners. 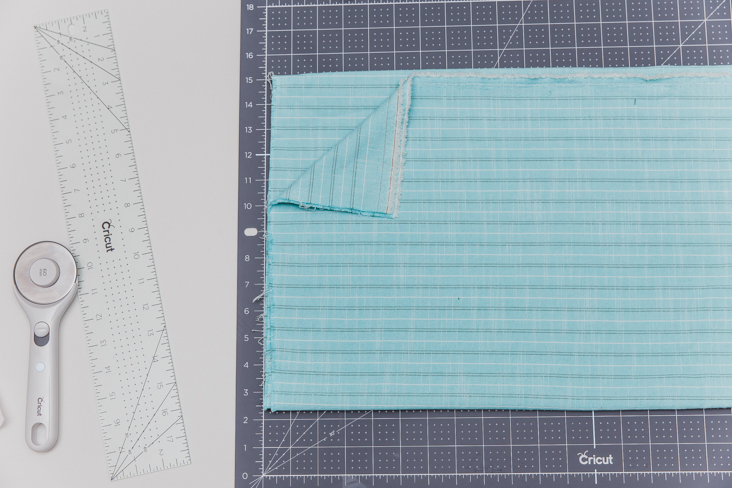 When corners are all cut, fold each end to the center and use the cut edges as a guide to repeat the cuts. Use knife to smooth corners as needed. 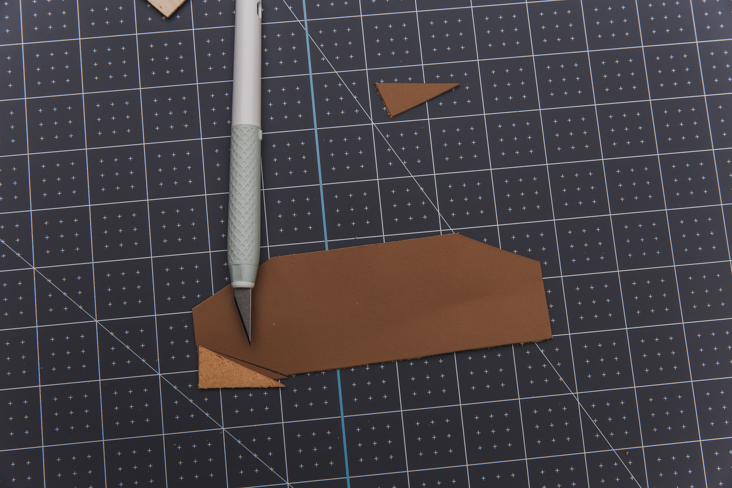 Cut a 1/4″ wide strip of leather, at least long enough to go around the center of the bow. I find it easiest to cut it extra long and trim the excess later. 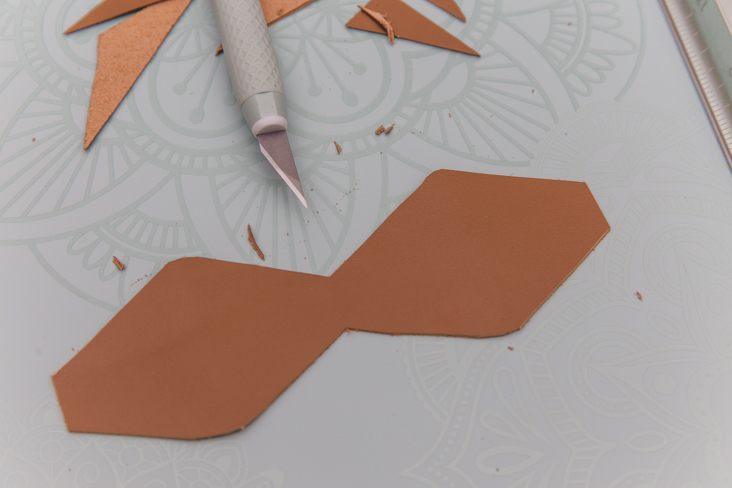 Use glue gun or e-6000 glue to secure ends of leather piece to center back. 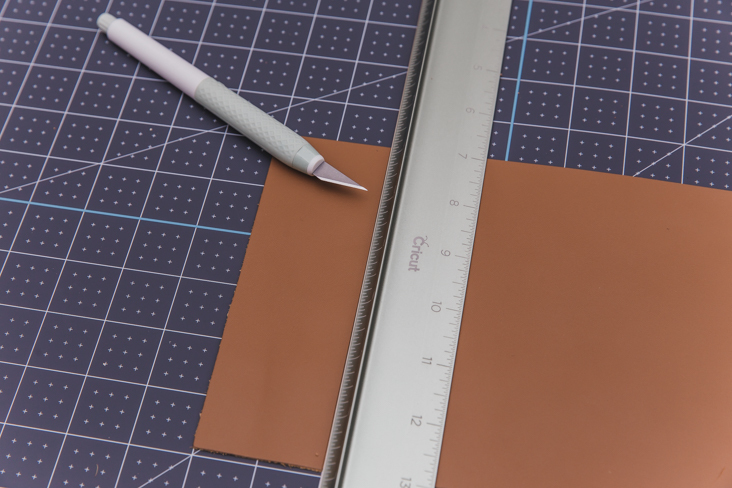 Depending on the leather, a glue gun might not hold well enough, and that’s when e-6000 is the best to use! Glue one end of leather strip to the back of the bow. Only glue near top of center bow as we want to leave a space to slide a safety pin (or hair clip) later on. 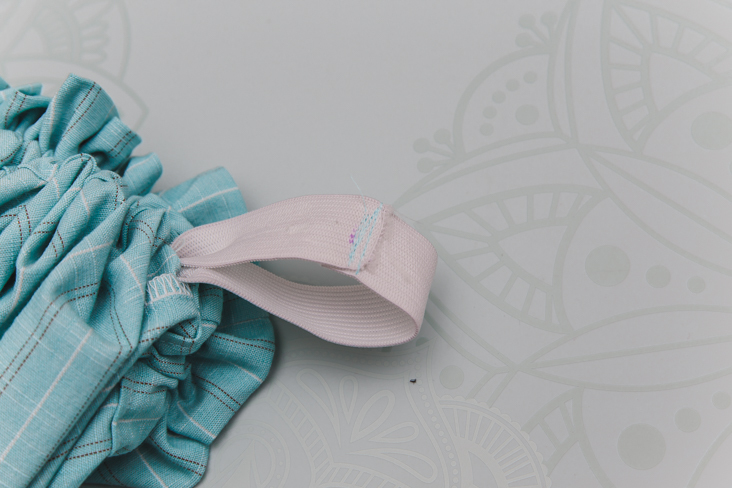 Wrap the strip around the bow, to the back, to measure length needed, and trim excess. Glue end in place, removing any excess glue to make sure you’ll be able to slip a safety pin under the strip. 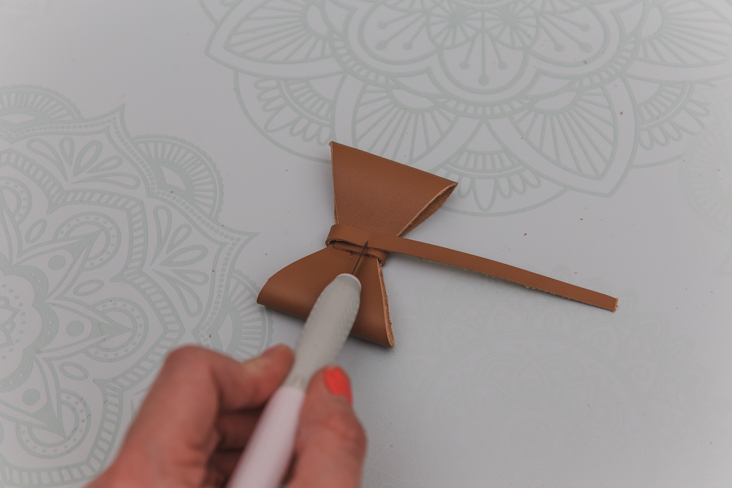 If needed, use clips to hold leather until glue dries completely. 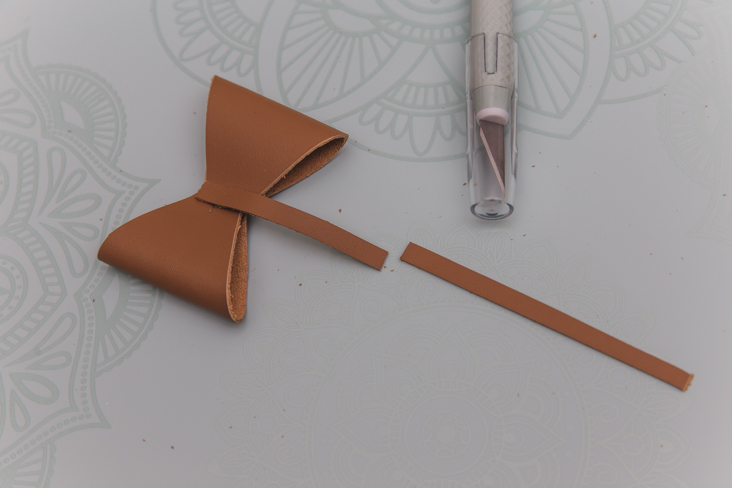 Once glue is dry, slide a safety pin under back leather strip and attach the bow to your skirt! 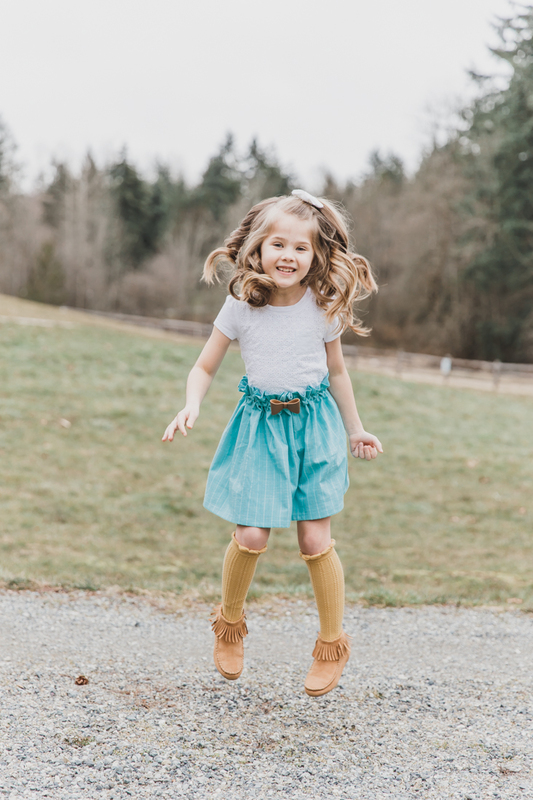 Whether I’m giving a skirt away to one of my daughters’ friends or to one of my daughters, I love to add a little personal touch when I wrap it up. 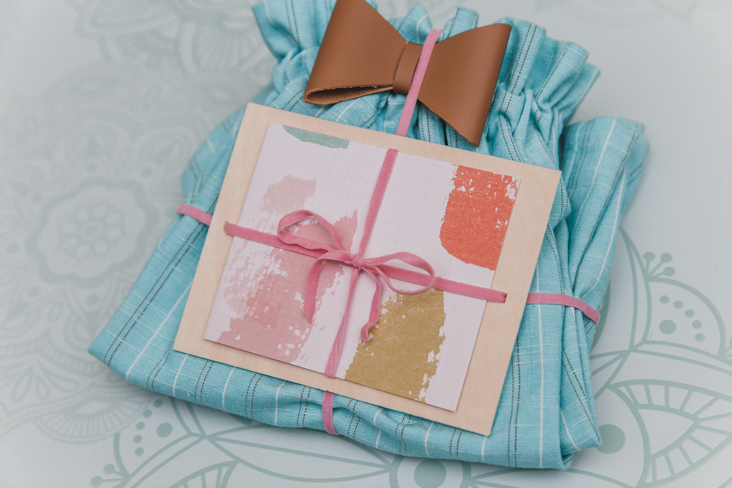 To make this DIY gift wrapping idea, first grab some fun paper that coordinates with the skirt fabric. 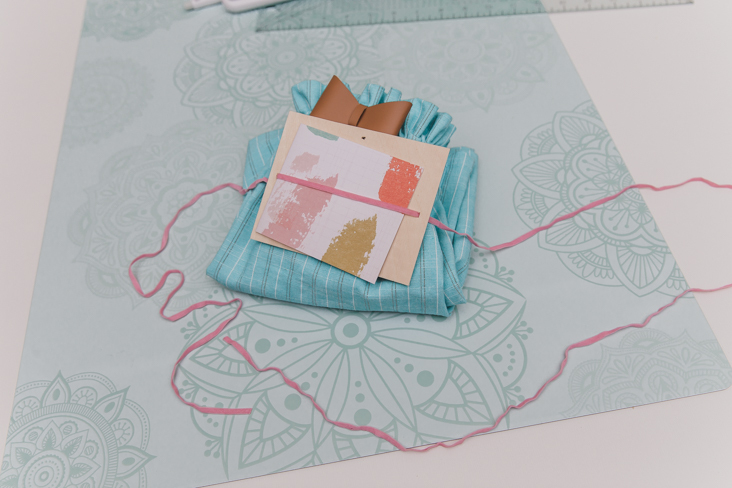 Working with coordinating fabric, paper, and tools made this project extra fun! 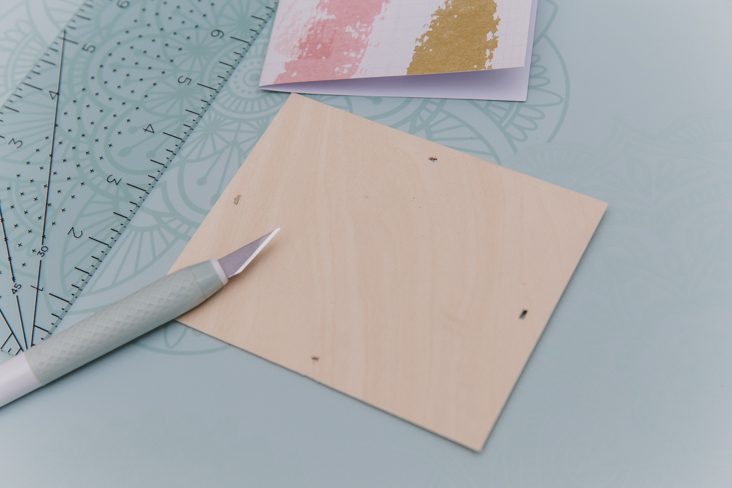 Use the true control knife and cutting ruler to cut the paper to the size of card you’d like, accounting for the fold, of course. 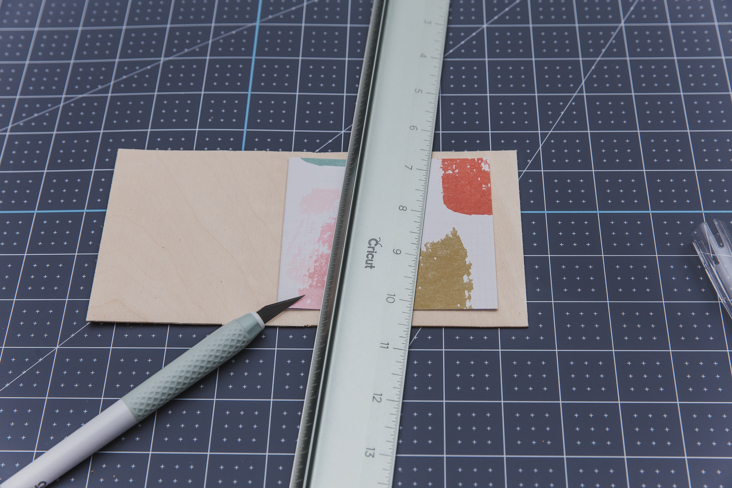 Next, grab a piece of basswood and cut it approximately 3/8-1/2″ larger than the folded card on all sides. 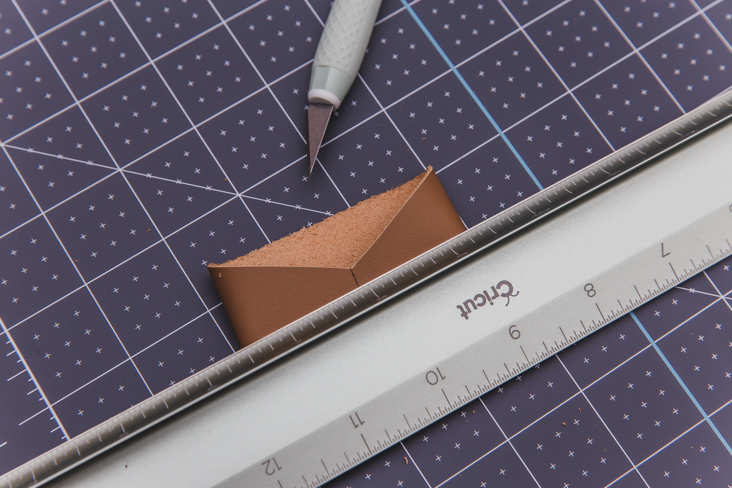 Use the knife to make small incisions on the center of each side. 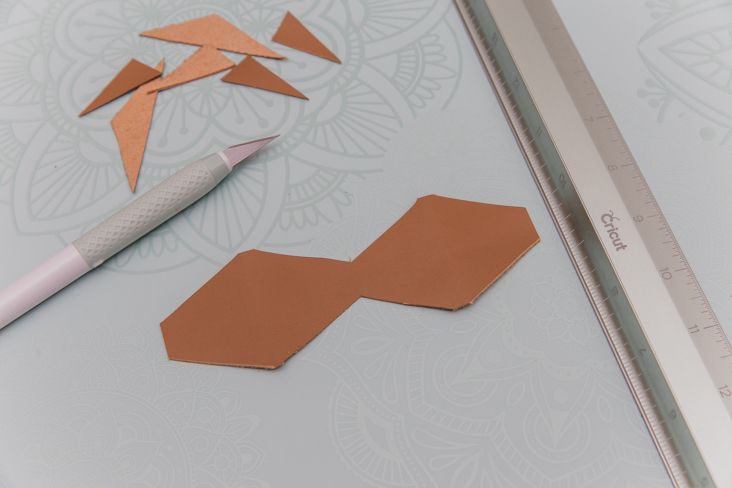 The incisions only need to be large enough to fit your faux leather lace or baker’s twine through. 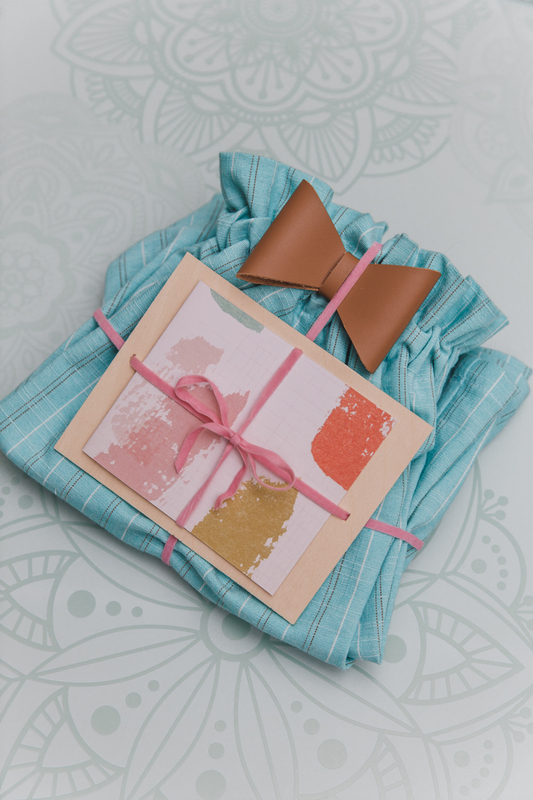 Place the card on top (after you’ve written a special note in it!) of the basswood and tread the lace through each side, entering through the top of the wood. Wrap the lace around the bottom of the skirt, crossing each other and bring each end back to the top, placing through remaining holes. 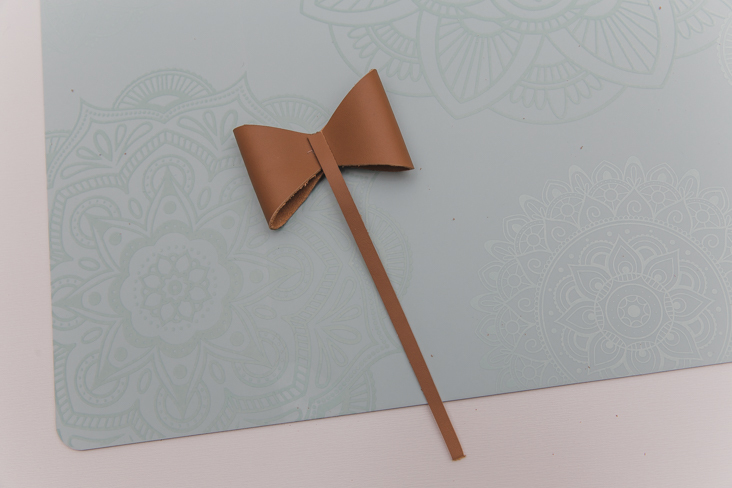 Tie the ends in a bow and voila! Great job! 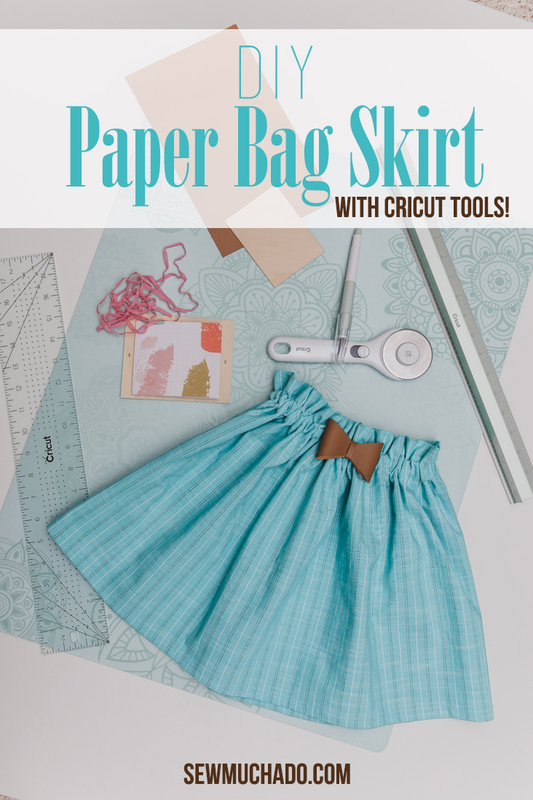 Now that you’ve learned how easy it is to make a DIY paper bag skirt, grab your Cricut tools and more of your favorite fabrics and make a few more!